There was a time when documentaries lived up to their name and actually documented a specific event. Filmmakers would capture the moment and perhaps offer some analysis or commentary. These movies were like long news stories. Then, documentaries began to change and the filmmakers would choose a specific subject to study. The promise with this kind of movie is that there's no guarantee that the subject matter is interesting or that it will be covered in the proper manner. Director Steve James' Life Itself is an odd hybrid. It was meant to be a documentary on a specific subject that wound up capturing an important event. 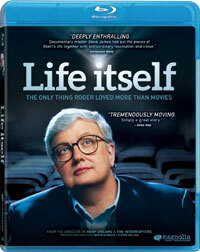 Life Itself focuses on film critic Roger Ebert. Documentarian Steve James, who had been acquainted with Ebert for years, decided to undertake a movie which tells the critic's life story. We learn about Ebert's childhood, his period in college in which he became a writer and was editor of the student newspaper, and his foree in journalism at The Chicago Sun-Times. The story then shows how Ebert started a multi-media career by agreeing to be on a television show with his friend rival, fellow critic Gene Siskel. From there, Ebert became a household name. But, the movie also shows Ebert's dark-side as well. He was known as being a know-it-all in college and he was also an alcoholic. We learn how a woman named Chaz turned that all around for him. However, things changed for the worse for Ebert when he was diagnosed with cancer. This lead to multiple surgeries which left Ebert without his lower jaw. As James was compiling his archival footage of Ebert and interviews with his friends and colleagues, he was also granted access to Ebert's hospital room where we see the critic, now speaking through a computer, living out the last days of his life. Roger Ebert may seem like an odd choice for a documentary, but just a quick overview of his life shows why it's a story worth telling. In an age where people become famous for doing absolutely nothing, Life Itself examines the accomplishments of a man who didn't seek the limelight, but tried to remain true to his convictions when it arrived. We also see a man who clearly loves his wife and his family, as well as this project. I'm not ashamed to admit that watching the footage of Ebert in the hospital is tough, as we can see through his face. But, it also took a lot of bravery and humility on his part to allow himself to be filmed in this condition. That's the kind of movie Life Itself is -- We see who Ebert is, warts and all. The movie does have a few drawbacks. The most glaring one for me was that we are told numerous times that Ebert won the Pulitzer Prize, but we are never told what for. Was it for a single piece or for a body of work? It's not James' fault that he was working with Ebert at a time when the man could barely communicate, but that does create some issues. We see archival footage of Ebert at work and we hear his peers discuss him, but it's still difficult to get a feel for who Roger Ebert was. We hear about his passion and his accomplishments, but unlike a lot of movies about celebrities, there aren't many interviews with him and this creates a sort of disconnect where we are hearing everything second hand. I'm sure that some don't see what the big deal was about a man who talked about movies for a living. But, Roger Ebert did much more than that. He loved movies and that came through in his work. And unlike a lot of critics, he was only to movies from many genres and with various levels of artistic merit. This enthusiasm made him more respectable, and even when you disagreed with him about a movie, you wanted to know his opinion. Life Itself gives us a fairly good look at this man and anyone who gives Halloween four stars is OK by me. Life Itself should not be watched while eating on Blu-ray Disc courtesy of Magnolia Home Entertainment. The film has been letterboxed at 1.78:1 and the Disc offers a transfer which runs at an average of 30 Mbps. The movie consists of many different elements, and some of the archival footage shows unavoidable grain and blurring. The new footage of Ebert in the hospital is sharp and clear, showing no grain or defects from the source materials. The Disc contains a DTS-HD Master Audio 5.1 track which runs at 48 kHz and an average of 3.5 Mbps. The track provides clear dialogue throughout. Being a documentary, we don't get many dynamic sound effects here. Those speaking are always clear and audible and some musical cues flow through the rear speakers. The Life Itself Blu-ray Disc contains a handful of extras. The Disc offers fifteen DELETED SCENES which run about 22 minutes. This is an interesting menagerie of scenes which provide more footage of Ebert in the hospital, but also show us more of his activities and his personality. "Sundance Tribute" (7 minutes) is a brief film which was shown at Sundance in 2013 as Ebert posthumously received an award. "Interview with Director Steve James" (11 minutes) allows the filmmaker to talk about his approach to the material and what it was like to work with Ebert. "AXS TV: A Look at Life Itself" (2 minutes) is simply an extended trailer with a few sounbytes from the previous James interview. The final extra is the actual TRAILER for the film.